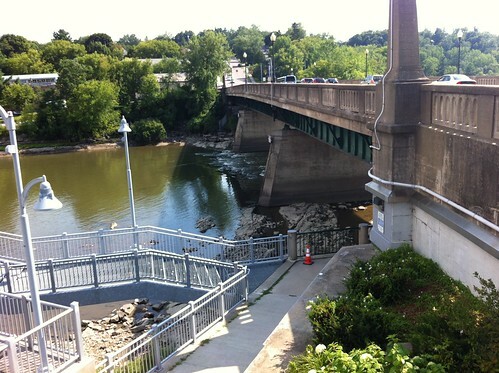 Last week I was walking over the Colchester Avenue bridge between Burlington and Winooski and I noticed the sound of rushing water under the bridge. 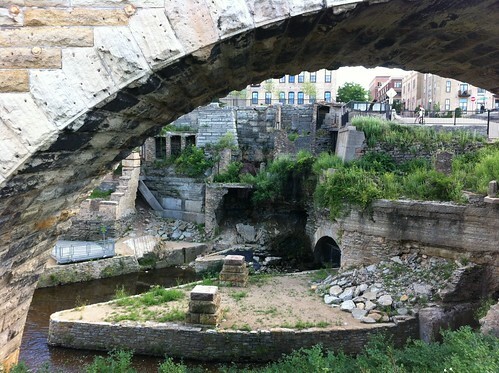 ... but the water under the bridge is usually deep and slow-moving, because of the dam just downstream. I wondered if dry conditions had exposed some of the rocks in the channel, but it had rained recently, and the river was running a bit higher than it had been previously. 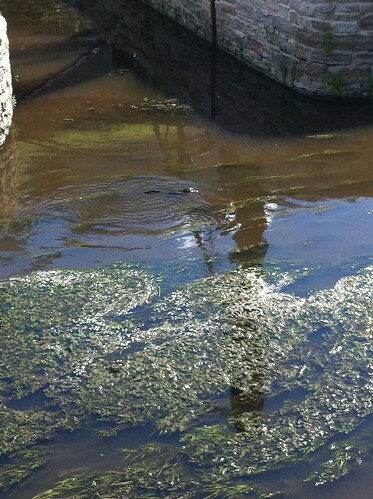 I glanced across the street and noticed a crane on the dam. The water behind the dam was about 8 feet below its normal level, probably due to the construction or maintenance occurring on the dam. 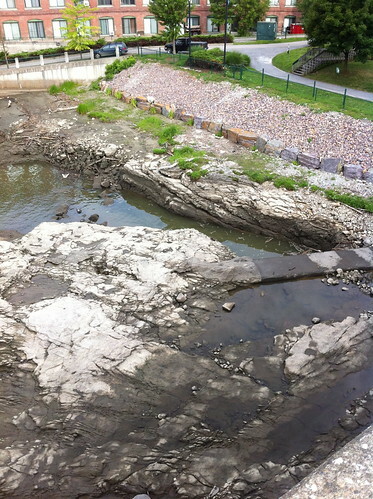 The lowered water level allowed a glimpse of the riverbed that is usually flooded behind the dam. In addition to the exposed bedrock, there was a smaller concrete structure that I'd never seen before. 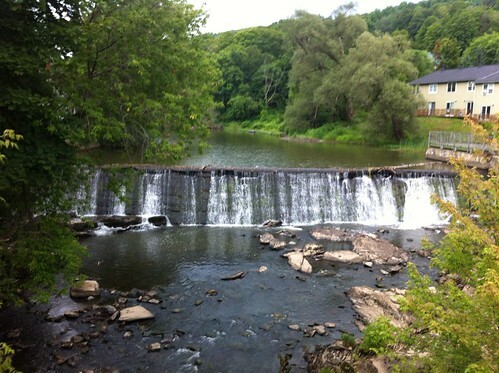 I'd assumed that the mill dam was built on a steep falls, just like the Middlebury waterfall, but in fact, the dam holds back water that would otherwise cascade over a series of rapids. 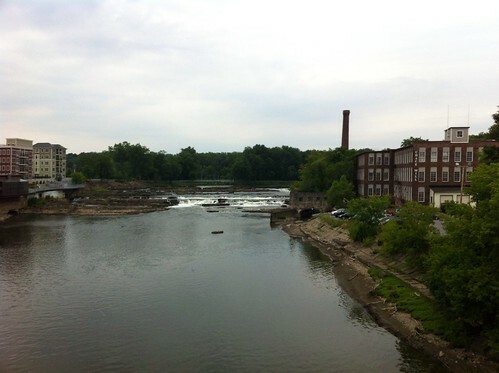 The area just below the dam is called 'salmon hole', and for good reason - Lake Champlain and the Winooski River support a population of landlocked salmon. Above: "Salmon Hole" during April snowmelt from April 2011, after a winter of record snowfall in Vermont. Before the dam was built, the salmon must have been able to work their way up the rapids. 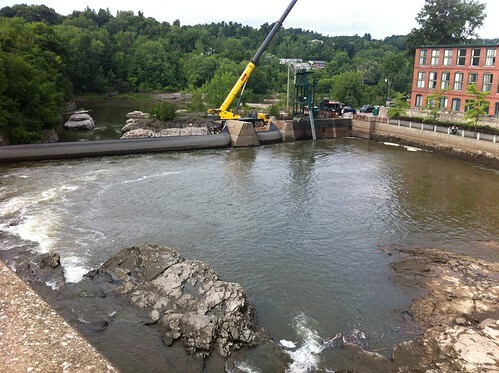 Now that the dam exists, the salmon are blocked in their path to spawn, but there is a cooperative effort to move the salmon beyond the dam and another dam just upstream. 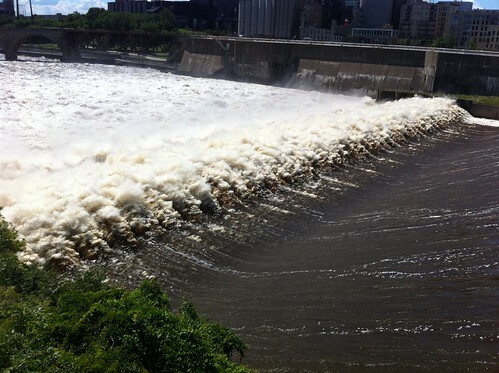 The dam also produces clean hydroelectricity - and unlike other larger dams, it doesn't flood a large area. It does flood the Winooski Falls Rapids, though, and I appreciated the opportunity to get a feel for what that part of the river was like before the dam was built. I'm not sure how long the construction will be going on, but if you're in the area, you might as well wander down to the bridge and check it out. 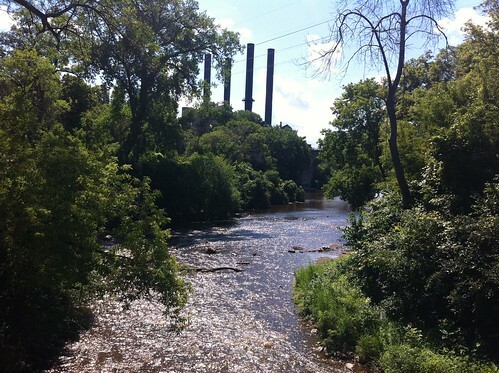 Even if the construction has ended, it's a good excuse to go visit the river. 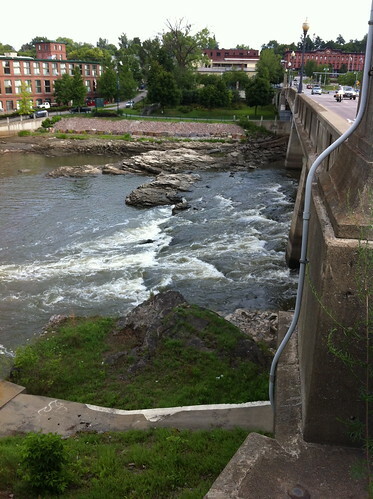 Click here for some historic photos of this dam and other dams on the Winooski. 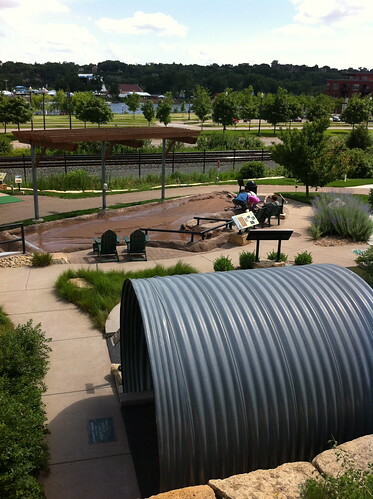 During our recent trip to the Twin Cities of Minnesota, we saw some very neat water exhibits at local museums. 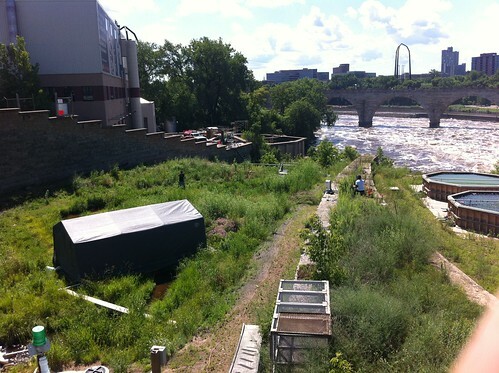 The Twin Cities lie on the Mississippi River, and the cities are very much celebrating the cultural and natural history of their river. 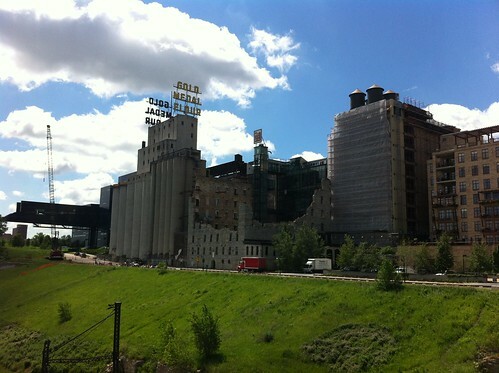 The Mill City Museum in Minneapolis sits on the site of what was once the world's largest flour mill. 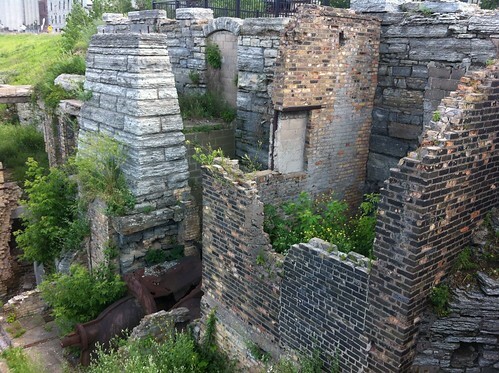 This mill used the power of the Mississippi River to turn vast machinery and process the copious grain crop of the Midwest. I talked a bit about these mills in this post. 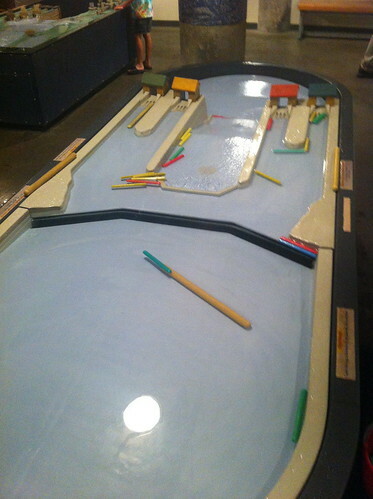 One of my favorite things about this museum was its very neat interactive water exhibits. They were probably designed with children in mind, but of course I immediately started playing with them as well. 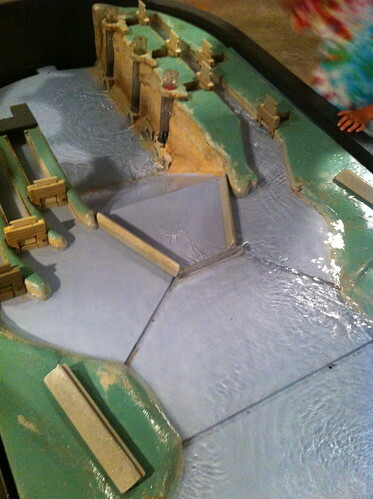 Of course, I tried using the bridge to dam up the river, and tossed the houses into the river to wash over the falls. Not something we'd want to see in real life but fun to do with little models. 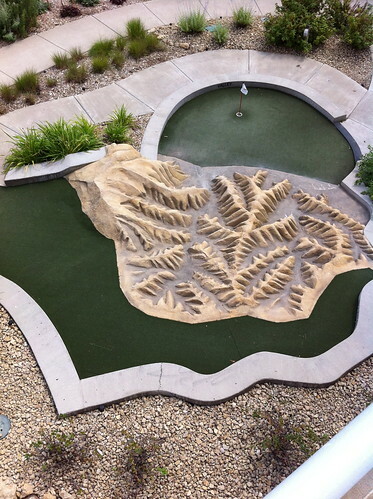 My only complaint was lack of sand for the river to flow through, but that would have made a big mess indoors. 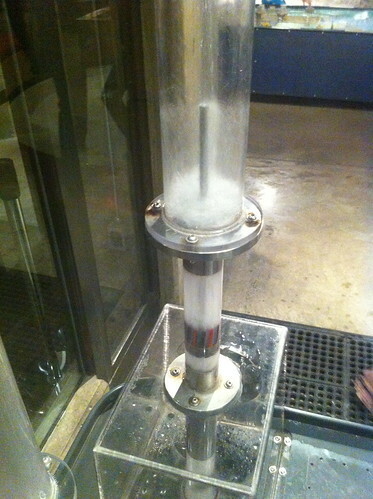 Visitors can plug the tube with their hands and feel just how much power and weight is behind even this small amount of water. 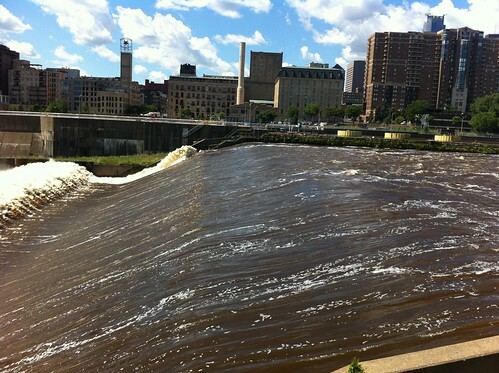 It's not hard to imagine how the mighty Mississippi, so many times larger, could power a whole city of mills. On the way out of town we visited Saint Paul, the twin to Minneapolis. 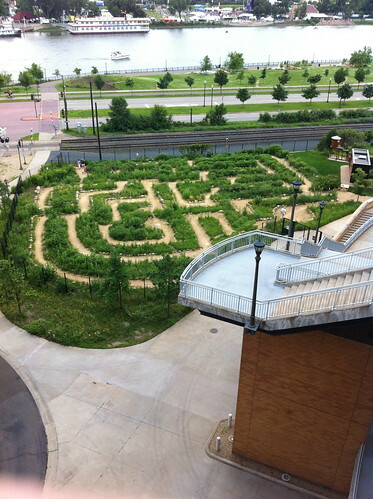 The Science Museum of Minnesota has a very neat area of outdoor exhibits called the Big Backyard. Sadly, I didn't have time to go in and check it out, but I got a chance to see some of the VERY neat exhibits. 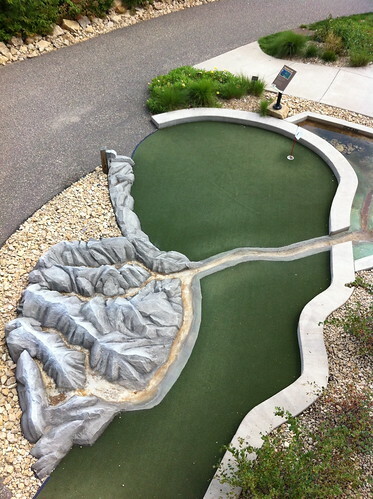 I was excited to see that there is a 9 hole Mini-Golf course that demonstrates many characteristics of rivers and watersheds. 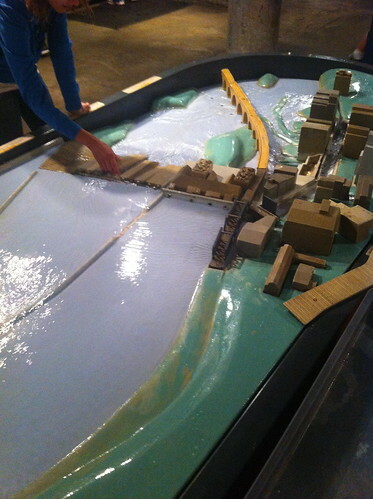 It looked like a very fun exhibit, and a great way of demonstrating river science. Much of what I learned about rivers was through playing in water moving through sand and mud (though often we had to haul the water with buckets!) This is the best way for kids to learn about how water moves through a landscape, and admittedly I myself could have spent hours watching the water erode different patterns through the sand. After all, water is scalable, and patterns seen on a small scale are extremely similar to the patterns larger waterways make. Alas, we wanted to drive beyond Chicago before we stopped for the night, to avoid Chicago morning traffic, so I didn't get to go in and play in the sand this time. 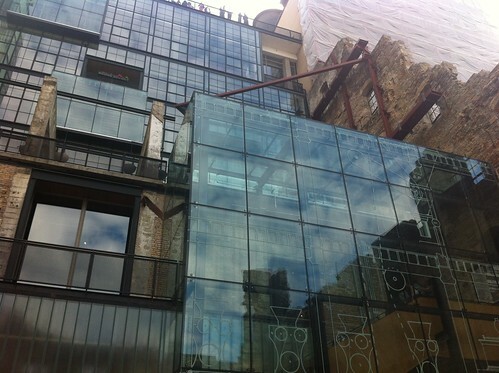 If I'm back out there again during the warm season, I'll sure check this part of the museum out in more detail! One of the things I like about Vermont is that every season is different. It's not just that the seasons change quickly, but also that each summer, winter, autumn, and spring is different from those before and after them. This summer, Vermont's weather has been defined by the intense heat and drought to our south and west. When the excessively hot weather pattern moves over us, we experience miserable heat (few people here have air conditioning, because it doesn't usually get very hot!). When the cooler air inevitably fights its way back into Vermont, it butts up against the very hot and humid air, creating violent thunderstorms. This pattern has recurred several times this summer so far. 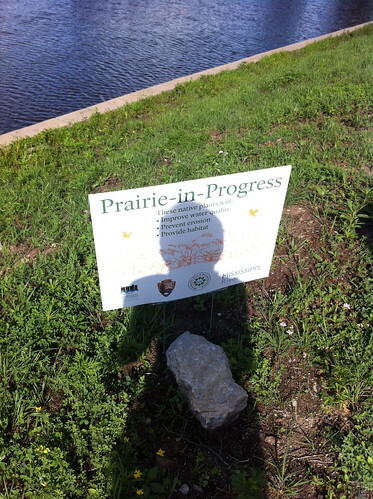 We experience beautiful, sunny days and chilly (mid 40s!) nights like today, but heat and humidity steadily increase each day until Vermont feels like an oven, or like Atlanta in the summer (which is hotter?). Then, we experience violent storms and the next day the cool weather returns. It's been drier than usual, and this compounding with the heat has lead to somewhat droughty conditions. The rivers are running low. 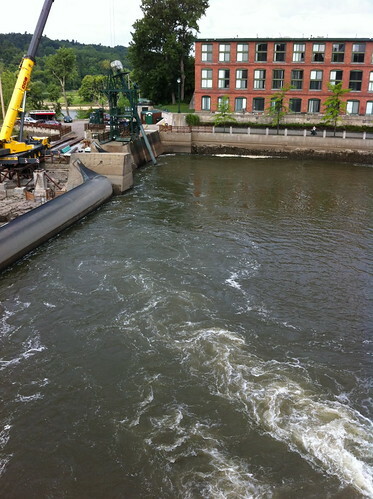 Above: water trickles over an old mill dam at the North Fork of the Winooski, well upstream in Montpelier. This is the lowest I've seen these rivers. I haven't been to the Middlebury River since we moved away... but I'm guessing it also got pretty low in some of the warm periods. Vermont needs the rain, but our dry conditions are nothing compared to the drought gripping most of the country. On the edge of the hot air mass, we have picked up enough storms to keep most of Vermont out of severe drought, but these storms have been spotty, and some areas have been quite dry. Above: Drought map from the NOAA Climate Prediction Center. The summer monsoon has brought some relief to the Southwest, but the drought seems to be spreadingnorth and east. Will it make it to Vermont? I hope not! Last Tuesday was Vermont's most recent bout of severe thunderstorms. They moved into Montpelier late in the afternoon, and the mix of the severe storms (which are often weird colors to begin with due to hail within the clouds and other factors) and the backlight of the evening sun led to some dramatic skies. As the storms moved in, the air was incredibly hot and muggy - over 90 degrees, with humidity well over 50 percent. The freakish heat and odd humidity reminded me of a fever - sticky, sickly, and fundamentally out of balance. That sort of heat and energy, when combined with abutting cold air, can lead to incredibly violent weather. Many areas experienced wind and hail, and perhaps some flooding. Montpelier escaped these, but was surrounded by extremely intense lightning. It was frequent enough that I was able to get some videos using my iPhone and 'movie' screen captures. 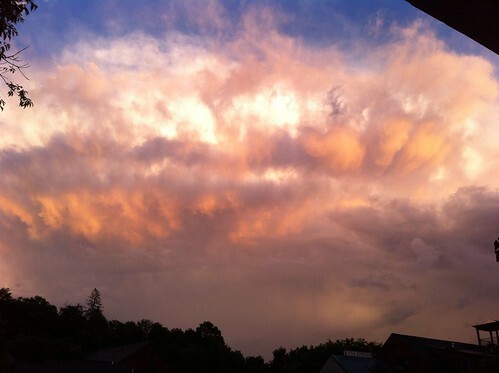 After the sun set, another wave of storms moved through. 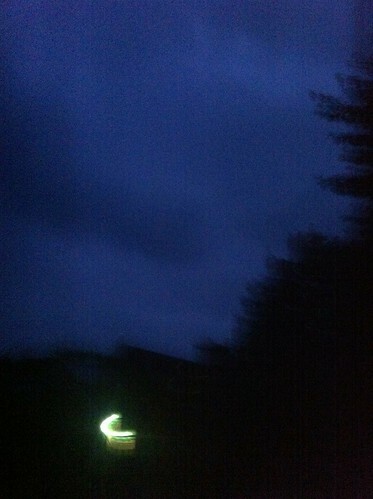 This time, the lightning was behind the rain, resulting in a sheet lightning effect. Most of the storms moved just to the south, right up the north facing slopes above the Winooski Valley. 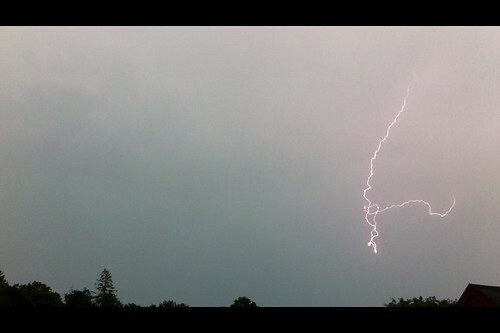 The lightning was incredible. At times, there were flashes every four to six seconds, rhythmically, pulsing twice like a heartbeat. I have no idea what made the lightning so periodic, because usually lightning seems more chaotic in timing. It was incredibly surreal. 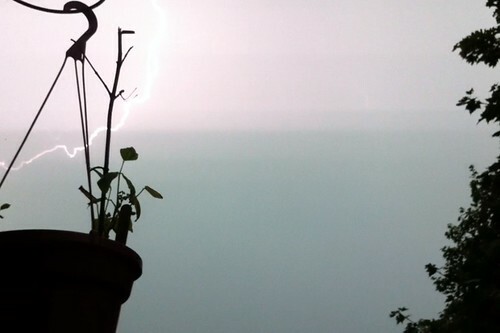 Above: sheet lightning lights up the sky. The storms have followed similar tracks with each summer wave, and the heavier rain (if not the lightning) has generally been missing Montpelier. Above: estimated precipitation totals from the RadarScope app. This image mirrors what other storms have done this summer as well. Most move south of town, with a few moving north of town. Our location has been rather dry. For whatever reason, the storms seem to be favoring Burlington, which they historically tended to avoid. Despite that observation, climate records show that Burlington on average gets about two thirds of an inch more rain each July than Montpelier, even though June and August are equally wet in both places. Montpelier, in return, averages a bit more winter precipitation, and a bit colder temperatures, which means about a foot and a half more snow. Perhaps more importantly, thaws with south winds can't work their way into Montpelier as readily as Burlington, meaning the snow stays on the ground longer too. So, despite the dry times right now, we'll have more snow to play in come winter. Meanwhile, I hope we avoid any ill effects from the severe storms we may get through the rest of the summer. After Irene and other weather disasters hit the state last year, we need a break! 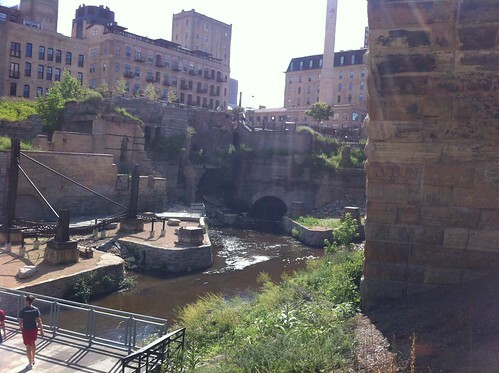 The main event of our recent road trip was a visit to Minneapolis, a beautiful city that, like Pittsburgh, is rediscovering its river(s). 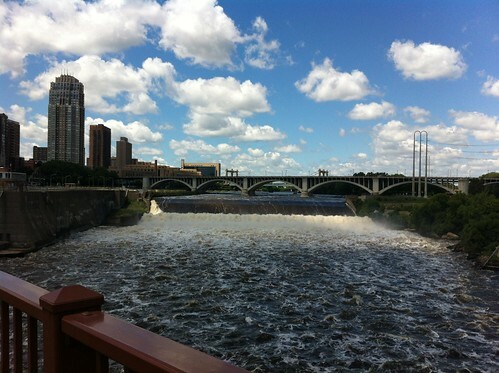 Minneapolis lies along the only significant falls of the Mississippi River. 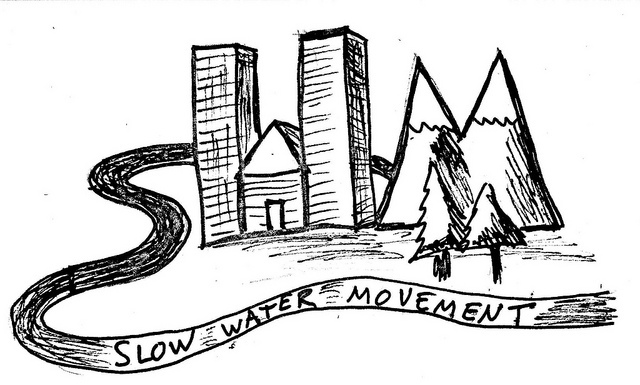 This put the city in an ideal position: abundant water power for its mills, but the ability to ship freight all the way down the river to the Gulf of Mexico and beyond. 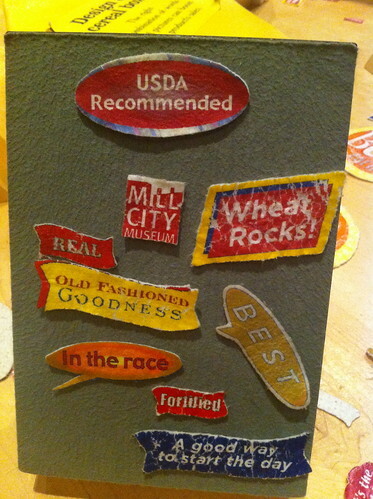 When water was the main power source, the breadbasket of the continent brought its grain to Minneapolis to make flour. 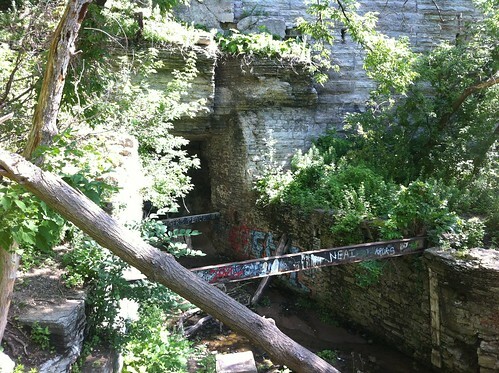 The dam built on the falls still stands, however. After heavy rains to the north, the river was raging. 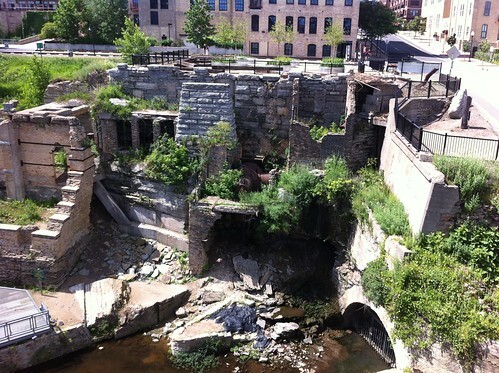 The water once used to turn mill machinery continues to pour over the dam, and while the mills are mostly gone, the city has built a small historic park around the mill ruins. The interplay between the river and the people who live near and use it is very poignantly visible here. 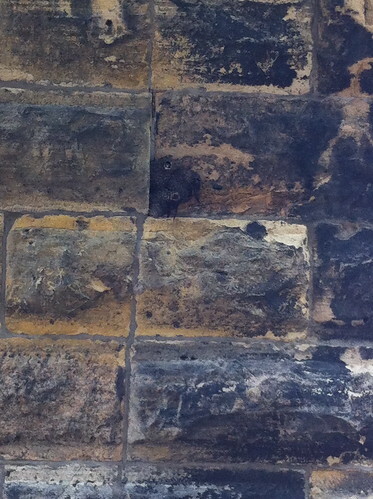 The swallows nest in the stones of the old bridges, perhaps cut from the gorge walls where they used to nest. 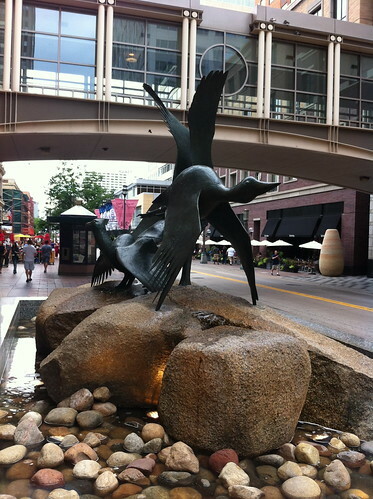 Encouragingly, rather than trying to shoo away the new residents, the people of Minneapolis have welcomed them with open arms. Some of the mill machinery has been repurposed to make hydroelectric power, and there is talk of expanding this in the future. In the mean time, the water continues to roll over the dam, heading down to the Gulf of Mexico as it has done over the millenia in the past. 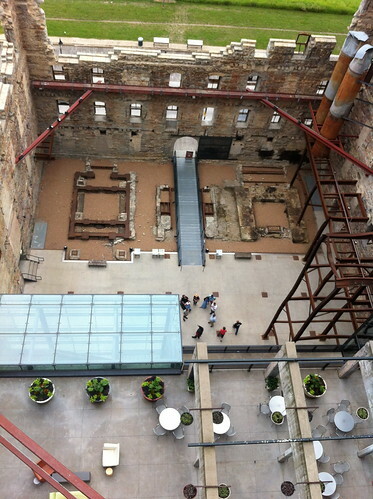 I visited two very neat museums in Minneapolis-Saint Paul which i will post about in a future post. 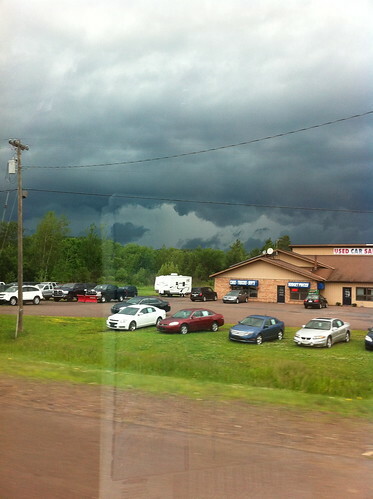 It was a beautiful day in the Upper Peninsula of Michigan, but in front of us the skies were darkening. 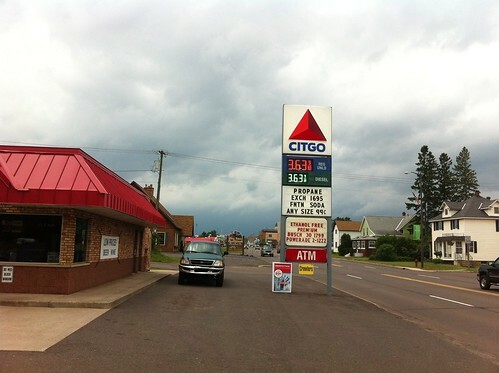 A fitful wind blew, and people at the local gas station talked of a line of severe storms on the way. I slowly pulled up the radar on my phone, through a spotty Internet connection, and checked out the line of storms. The line of storms indeed looked nasty, but was moving slowly. Waiting it out would probably mean losing the rest of the day. 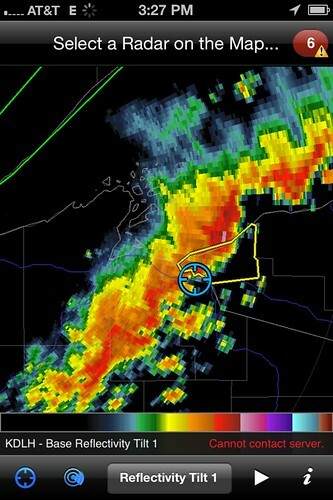 It seemed that there was a gap in the line along our path, so we decided to drive through the storm. As we started driving into the squall line, the clouds lowered. 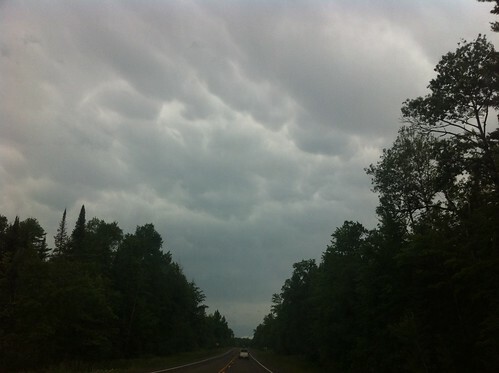 At one point they were CHURNING in an incredibly ominous way - instead of the motionless mammatus clouds near many severe thunderstorms, these throbbed and rolled like a sheet in the wind. There didn't appear to be any rotation of the sort that would form tornados, but to the north, where the storm was more severe, the sky turned a sickly green color - the type of color that seems to be reserved for the the most severe storms rolling off of the Great Plains. This color is almost never seen in Vermont, pretty unheard of in California, and is very bad news. I began to wonder if we were making a mistake. Needless to say we made it through the storm safely. 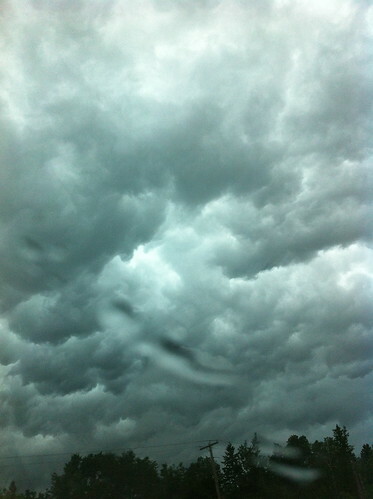 The wind was not severe, nor was there hail, but there was drenching rain. The rain was not particularly unusual for a severe thunderstorm, except that the line of storms was barely moving forward. At least driving through the storm we could get out the other side. When we finally reached the western side of the storm, in the Bad River Reservation of Wisconsin, we stopped at a store where we encountered a leaky roof and news of rising rivers. Several roads were closed, and just outside the store a culvert was belching forth muddy water at full capacity, with a concerned engineer looking on. The town just beyond was experiencing storm drain overflow and street flooding. 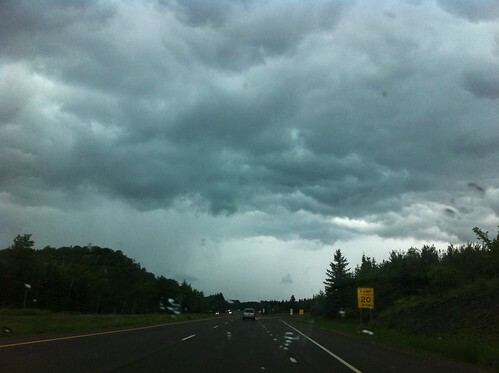 The rivers we crossed were absolutely raging, and as we drove southwest the rest of the way to Minneapolis we encountered scattered occasionally heavy rain and frequent lightning to the west and above us. The line of storms was still barely moving. 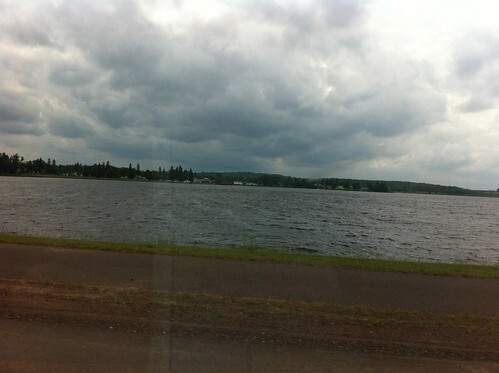 As it turns out, the storms had passed slowly through Duluth earlier that day. The storms completely drenched the area, dropping as much as 10 inches of rain and causing catastrophic flooding, seemingly comparable on a local scale to what Vermont experienced in Tropical Storm Irene. 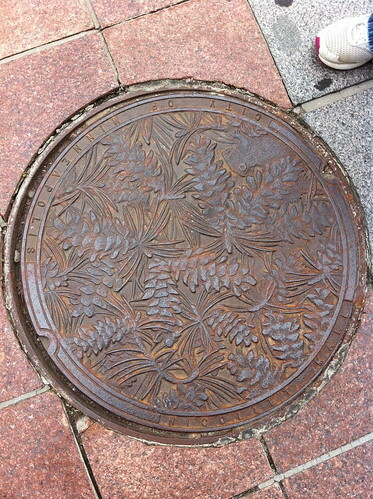 In short, a catastrophe, and a complete failure of the aging and obsolete runoff control structures in the city. About two weeks later we were enjoying a 4th of july dinner with new friends in Montpelier. 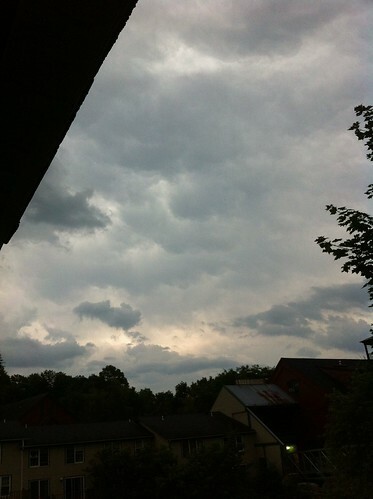 It was a hot, muggy day, and mammatus clouds (of the more stationary sort) again hovered overhead. Distant thunder rumbled, but one lightning bolt smashed down apparently in downtown Montpelier despite the storm still being closer to Burlington (perhaps a positive bolt out of the anvil?). Thankfully, we were safe in an enclosed porch area. 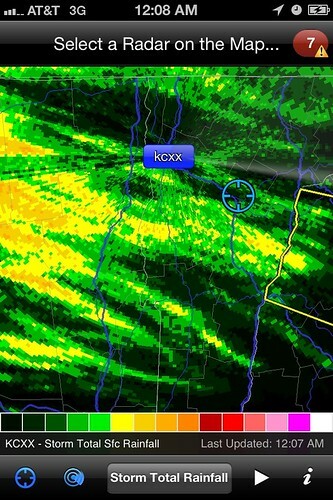 According to the radar, Burlington was getting hammered but the storm was going to pass just south of Montpelier. 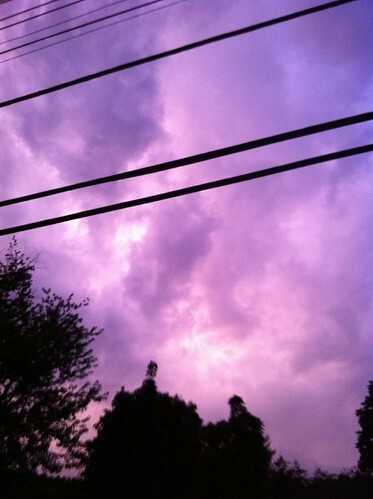 Then, to the south, I noticed a low, roiling line of extremely fast-moving clouds. Behind them the sky was slate-grey, but with just a hint of green. The line of clouds was moving towards us fast and unexpectedly - sign of a gust front. After just a few minutes the clouds raced directly overhead and the gust of wind hit. A swirling wind came up straight out of the south (the prevailing wind direction had been northwest), quickly rising to perhaps 50 or 60 miles per hour. With it came sheets of rain blown out of the storm to the south. The wind was gone as fast as it came, but as it wound down we heard a loud pop and saw smoke rising across the river. With it was a flicker of flame or sparks and an odd burnt smell. I immediately called 911 to report the fire. 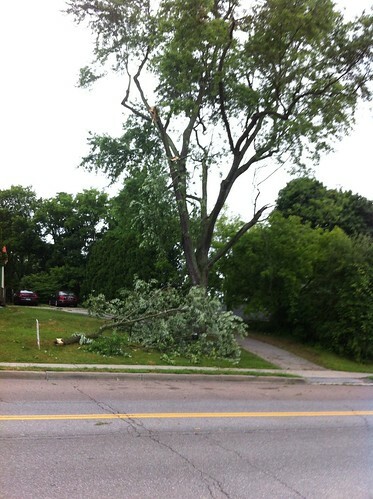 We later learned that it was caused by a large maple tree falling across power lines. Thankfully the fire did not spread, and crews quickly deactivated the power lines. As the storm moved off to the east, it maintained its intensity, and the towering clouds caught the light of the setting sun. 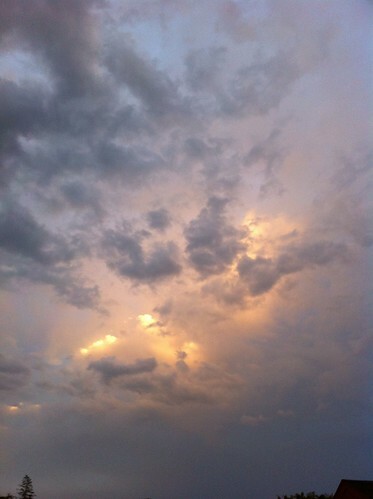 The scene was beautiful, and even more impressive in person as the departing storm flickered with frequent lightning. What we experienced, again, was the edge of a storm. 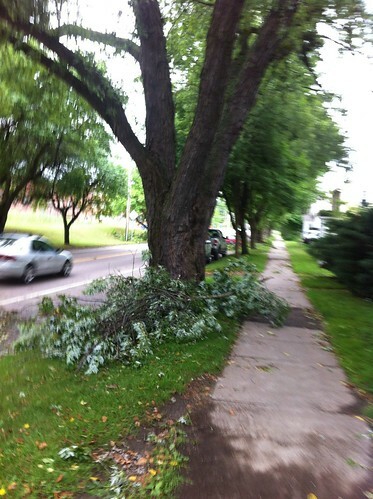 Aside from the one maple tree, Montpelier did not sustain serious damage that I am aware of. In Burlington, it was a whole other story. A 'bow echo' line of thunderstorms scored a direct hit on the Old North End and downtown sections of Burlington. The city experienced sustained 60 to 70 mile per hour winds that brought down numerous trees, and up to two inches of rain in a very short amount of time. The branches brought down by the wind immediately clogged culverts, and the water had nowhere to go. Soon several areas of the city were flooded with waist-deep dirty water. The Burlington storm wasn't quite as wet as the Duluth storm, but the winds made for a storm that will be remembered for quite some time. There's been a lot of talk linking these storms to climate change, but it's important to remember that storms like this are not all that uncommon in Vermont. They just generally hit sparsely populated areas, because most of vermont is sparsely populated. This storm will be remembered not only because of its severity, but because it hit the largest city of Vermont and struck a glancing blow on the state capitol on the Fourth of July (thankfully, Montpelier's parade and festival was held on the 3rd this year). The extensive damage of this storm would have only been of note to foresters, ecologists, and perhaps a few farmers if it occurred in many parts of Vermont. On the other hand, there's been a very intense heat wave over much of the country, and both of these storms formed on the edge of the heat wave area - a place where severe thunderstorms often form in midsummer. If climate change caused the heat wave to become more severe, perhaps it caused the storms to become more severe as well. The storms also highlight the need for better flood and runoff management in our cities and towns. 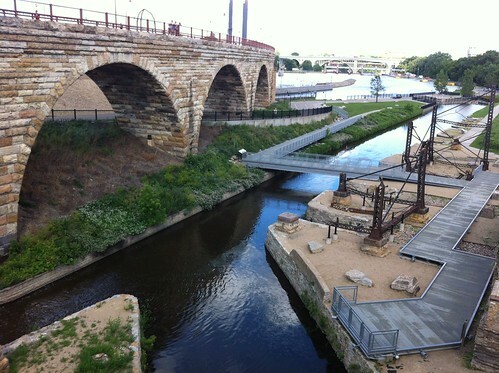 The Duluth flood was made much worse by aging infastructure. The Burlington flood largely struck areas along a historic stream channel that is now routed underground (see light blue line) - but unfortunately is unlikely to be a candidate for 'daylighting' as it passes through the densest part of the city. I don't think rain gardens, empty rain barrels, pervious pavement, and other 'slow water' measures would have completely stopped the floods, and they certainly wouldn't have decreased the wind that damaged so many trees in Burlington. However, the weather before this storm had been quite dry, and those measures probably would have done a good job of decreasing the magnitude of the flood and its associated damage.